Norman has put Harry's life in danger on countless occasions over the years and the American Son project was no different. When Norman had risen to the highest rank of law enforcement after the Skrull Invasion, he wanted Harry to share in his success. 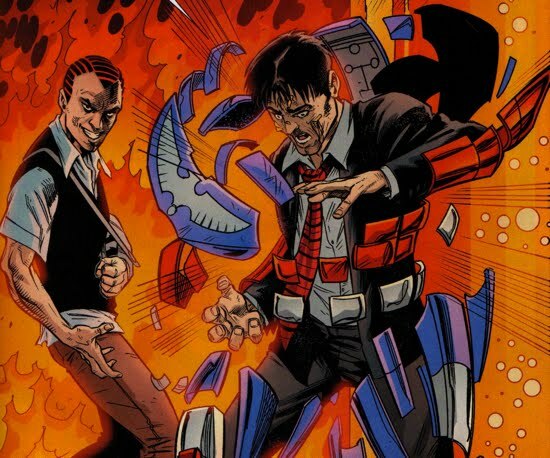 Norman created the American Son persona, a side kick-esque partner for Norman's Iron Patriot, for Harry to embrace. At first Harry rejected his father's request to join the Avengers, however, after discovering that his ex-girlfriend Lily Hollister (aka the villain Menace) was pregnant with his child, Harry had a change of heart. But his decision was not because he wanted to help his father, he wanted to find a cure for Lily so that they could raise their child and live happily ever after. 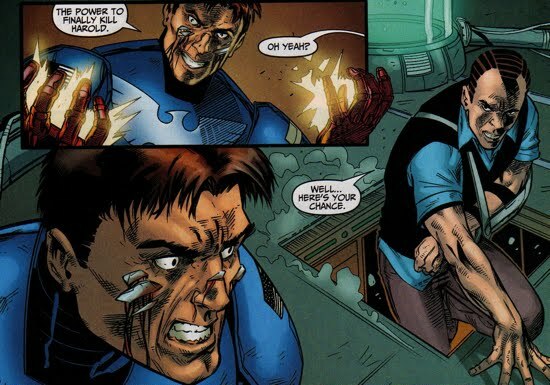 As with most Osborn related dilemmas, this one went from 0 to crazy in a matter of days as it turned out that Lily was secretly working for Norman in an attempt to coerce Harry to join the Avengers. Once an Avenger, Harry was to die in a martyr-like fashion, strengthening his father's cause. It got worse for Harry too, because Lily soon revealed to Harry that Norman was the father of her child. In the end, Harry stood up to his father, rejected the American Son role on the Avengers, and left Lily behind to live with Norman. Suffice to say that this series of events took its toll on Harry and soon relapsed back into his prescription pill (oxycodone) addiction. Harry struggled to curb this addiction in the months that followed. Ironically Norman's affair with Lily was not the first time he had conceived a child with one of Harry's ex-girlfriends, he had also impregnated Gwen Stacy a few years back. Gwen gave birth to twin children and her son, Gabriel, would soon figure into the American Son equation. The last time Gabriel was seen, he was in France struggling to overcome his drug addiction with the help from his twin sister Sarah (summarized here). 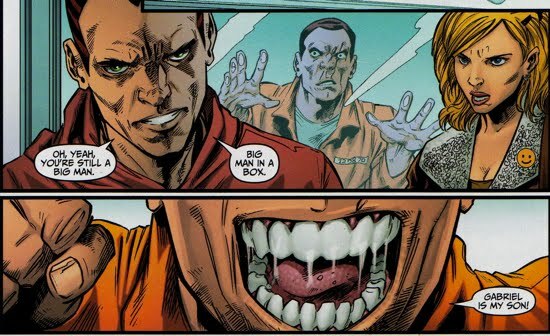 In the one-shot Dark Reign The List: Amazing Spider-Man, Spider-Man broke into Oscorp's Manhattan office and stole security footage that contained Norman's experimentation on human beings. Using humans as guinea pigs is nothing new for the Osborns (see Origin of the Goblin Formula and New Ways to Die) and Norman once again employed that strategy to optimize his American Son project. Peter Parker eventually released the video footage to the public, but Norman suffered very little recourse from the footage as his propaganda machine crushed Parker's efforts. However, unbeknownst to Norman the FBI had infiltrated H.A.M.M.E.R. in order to keep tabs on him. One of the federal agents, Frank Ryan, posed as a security guard for the American Son laboratory. 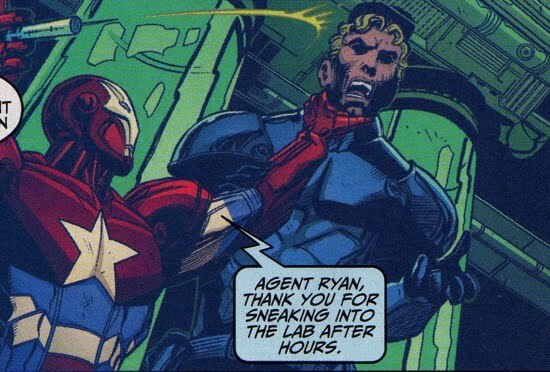 When Agent Ryan snuck into the lab after hours, Norman found him and decided to eliminate the spy (as seen in a flashback sequence in American Son #1). He subjected Agent Ryan to testing, mutating him into a monstrous being. The FBI was not aware of Ryan's fate, they believed that he died in a lab explosion. 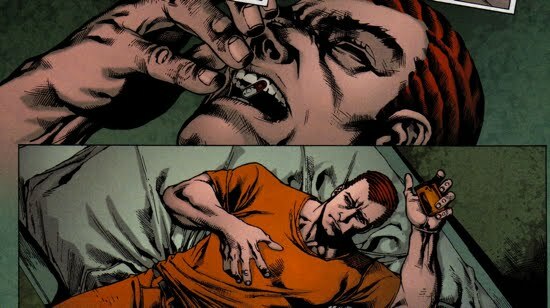 They had been misled intentionally by Osborn, but after he was deposed from power, the monstrous Ryan broke free and began to wreak havoc across New York City. 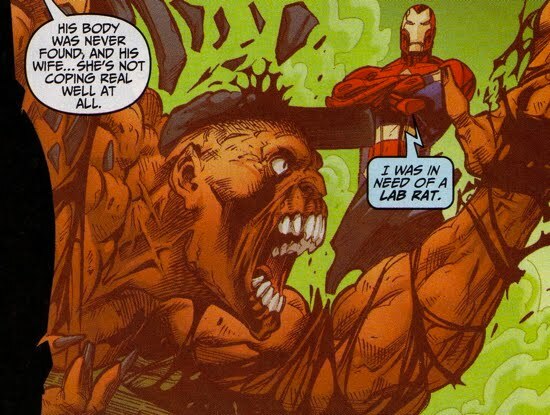 The day after Osborn's defeat at Asgard, a mysterious figure purchased some of Osborn's old laboratory equipment, specifically the American Son suit of armor. 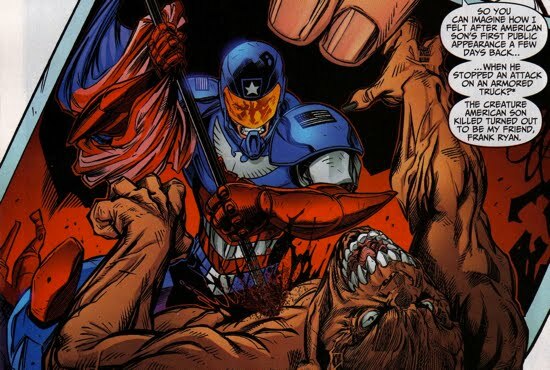 This was also depicted in a flashback sequence in American Son #1. In Age of Heroes #2, the mutated Agent Ryan's reign of terror was abruptly cut short by the American Son, who brutally murdered the monster in defense of the public. Norah Winters and Spider-Man witnessed the 'heroic' deed and both presumed Harry to be the one behind the mask. Norah had investigated the debut of American Son and even discovered some of Norman's dirty secrets back when he was running the Avengers. But Norah never went public with her story because Norman threatened her life if she were to publish it. 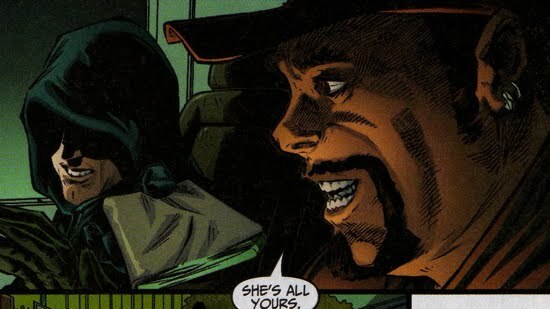 With Osborn incarcerated, Norah felt more comfortable pursuing the new American Son that was now protecting the public. 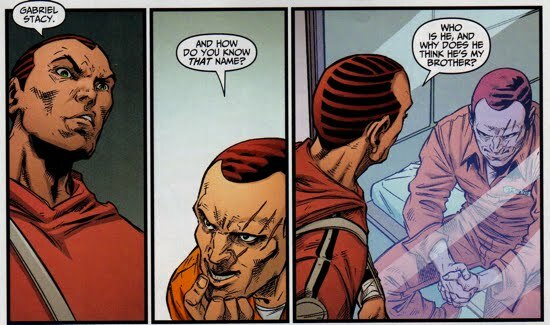 In American Son #1, Harry Osborn was approached by FBI Agent Owen, who also happened to be Agent Ryan's former partner. He was investigating the mutated monster that was terrorizing Manhattan, which turned out to be his supposedly deceased partner. Harry was an obvious suspect because of his ties to the American Son in the past and because many believed that he was trying to salvage the recently tarnished Osborn name. Also, as an added facet to the investigation Agent Owen informed Harry that he was investigating the disappearance of $300K worth of diamonds stolen from the back of the truck. Since the American Son was at the scene of the crime, he was now a suspect. Harry denied the charges and requested that Agent Owens leave the premise Later that evening at the Coffee Bean, Harry was confronted by Gabriel Stacy who informed Harry that he was not Norman's only son. He then pulled a gun on Harry and shot him point blank as Harry stood behind the counter. Suddenly, the American Son came blasting through the door of the Coffee Bean neutralizing Gabriel and rescuing Harry in American Son #2. The American Son then took Harry to the ESU hospital where doctors were able to save him (the gunshots missed all vital organs). Norah Winters swindled her way into Harry's hospital room to get the scoop on his shooting. Harry then left the protective custody of the hospital and took Norah with him to document his actions, he was going to give her the story that she was after. He was forced to keep his left arm in a sling due to the gunshot, not too bad of an injury considering that he had been shot at point blank range. The duo paid a visit to Norman at the Raft and Harry wanted to find some answers. After the two traded passive-aggressive digs at one another, Harry cut to the chase. He wanted to know who Gabriel Stacy was and why he thought that he was Harry's brother, but Norman did not concede the information very easily. Fed up with Norman's mind games, Harry decided to leave the prison but not before making one last attempt to piss off his father. In retaliation for Harry's snide remarks, Norman exclaimed, "Gabriel is my son! And knowing he took a shot at you, I suspect he's more my boy than you are!" Meanwhile, back at an abandoned warehouse, Gabriel lashed out at the American Son armor, scolded it for rescuing Harry. As Gabriel struggled with his demons, Harry and Norah went to the Frontline offices to give Urich the word that they were going to go public with truth behind Gabriel Stacy and the American Son. 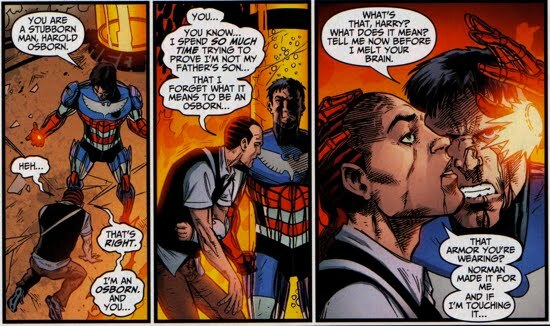 During a flashback sequence in American Son #3, Norman was portrayed as disinterested and difficult father toward his son Gabriel. Norman's treatment toward Gabriel caused him to grow up resenting Harry because he believed that Norman loved him more than he did Gabriel. 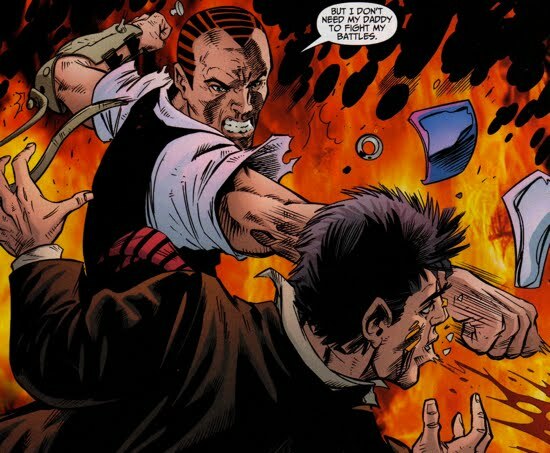 The motivations behind Gabriel's attack on Harry at the Coffee Bean became more evident as it was clear Gabriel found Harry to be in competition for Norman's approval. The interesting facet to this story is that Harry, who was also exiled in Europe under Norman's safeguard whilst being thought dead back in the U.S., was completely unaware of Gabriel and Sarah's existence. Norman kept Harry from Gwen's twins and vice versa, apparently Norman did not want his 'worlds' colliding. Back to present-day, Harry was visited by Agent Owen who was now in possession of the security footage from the attack he suffered the previous night. Peter Parker interrupted their conversation and after Harry insisted that Peter watch the tapes as well, Owen complied. The video footage revealed a stunning occurrence, Gabriel shot Harry, then quickly exited the shop, only to return moments later as the American Son to rescue Harry. Proof that Gabriel Stacy was the American Son! The twist was that Gabriel had a fractured psyche with two halves, the malevolent Gabriel Stacy and the heroic American Son. The group quickly realized that if Gabriel could not find Harry, he would seek out someone close to him. Enter Norah Winters. Luckily (and unluckily at the same time), Norah is swooped away safely by the American Son in an attempt to protect her. The problem arose once they returned to Gabriel's hideout and he shed the American Son armor, the resentful Gabriel took over and he attacked Norah. But the deranged Gabriel proved to be his own worst enemy, as his American Son persona began to re-takeover his mind, forcing him to reconsider his actions. Suddenly, Spider-Man blasted in through the windows to save Norah, but to no avail. 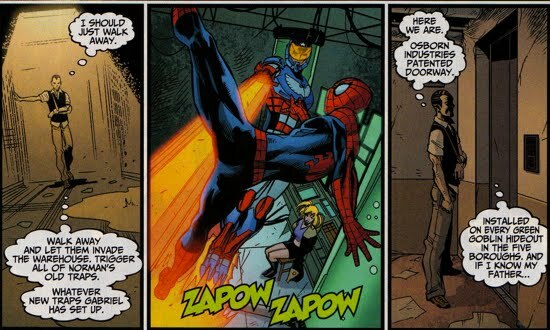 Gabriel was a formidable foe and he sent Spidey flying back out of window with one punch. Harry then arrived through the hideout's secret passageway (the hideout was one of Norman's old establishments) to challenge Gabriel. 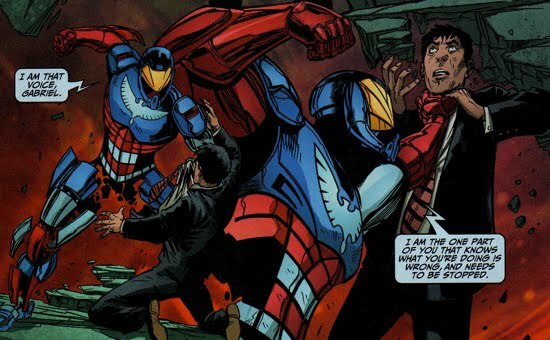 Gabriel's initial run as the American Son ended in American Son #4 as the one-armed Harry battled his brother inside their father's abandoned hideout. Harry set off the self-destruct code inside the building, which caused it to go up in flames. Gabriel attacked Harry and had him completely vulnerable, then Harry played the trick up his sleeve. He remembered that Norman built the armor for him, so if he was touching it, his vocal command would direct the armor. Harry to the American Son armor to simply, "Disassemble". 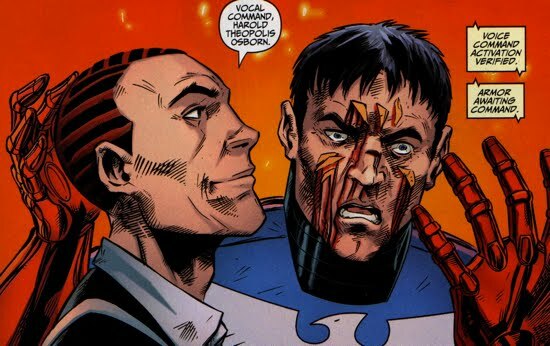 The suit responded and Harry was able to remove Gabriel's weapon, a few punches later and Gabriel had been knocked out. Spider-Man arrived to help Harry and Gabriel escape, and Harry let the American Son armor behind to burn in the flames. A few days later, Norah arrived at the Coffee Bean to thank Harry for letting her share his story with the world. She also warned him that she was aware about his oxycodone problem because she had seen the prescription was from a date that preceded his shooting. Harry ensured her that he was getting his life in order, he was later depicted to be still popping pills. Meanwhile back at the Raft, Norman was getting briefed by one of his security guards, named Calvin, as to the status of Harry's coffee shop. After hearing the update, Norman wanted to know the location of his other son. 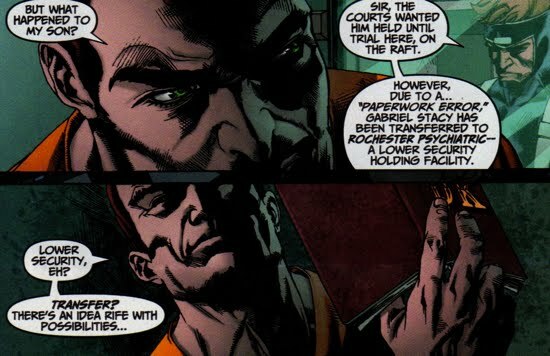 The guard informed Norman that Gabriel was supposed to be held at the Raft until trial, but due to a "paperwork error", he was being shipped to Rochester Psychiatric (a lower security holding facility). Before dismissing Calvin, Norman asked if the American Son armor was recovered. Calvin confirmed that the armor was recovered and delivered to Gabriel upstate. Soon after, Gabriel is depicted opening a package that was delivered to him in Rochester. When he opened it he found the American Son mask, which asked of him, "Have you missed me?" It appeared as though Norman was reveling in the fact that his son Gabriel was suffering from a dissociative identity disorder. Norman had the American Son armor shipped to Gabriel with the sociopathic goal of forcing his son back over the edge...father of the year once again! It should be noted that it is debatable (at best) as to whether or not Norman himself suffers from a similar psychological affliction. Although recent stories have depicted the Goblin as a distinct personality, historically Norman and the Goblin have been one identity. 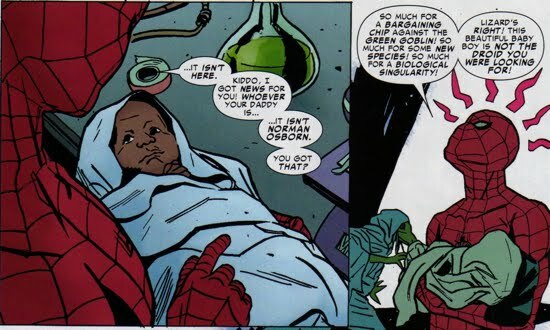 One interesting side note to this story arc was Harry referring to Osborn Industries (the original name for Norman's company, as opposed to the more recent Oscorp) in American Son #3. 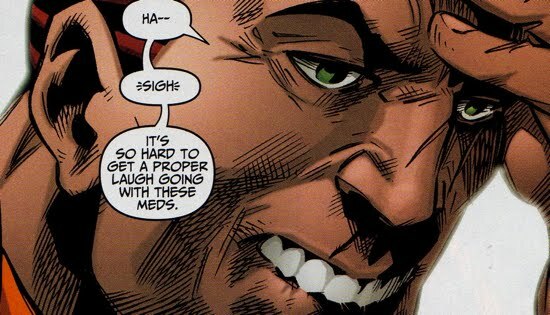 Osborn Industries was the name of the company before and at the time of Norman's 'death' in Amazing Spider-Man #122. That name was also used in the years Norman was exiled in Europe, it was not until Norman's first arrest (in the Thin Air story arc featured in The Pulse #1-5) that Oscorp was first used. Oscorp has been the preferred name ever since, it is possible that Norman's company changed names but that was never explicitly stated anywhere.